It wasn’t long ago that every branded social media post looked like every other advertisement. Brands took an old approach to marketing and applied it directly to a new, unexplored medium. The results were clunky, out of touch and, most importantly, largely ignored. 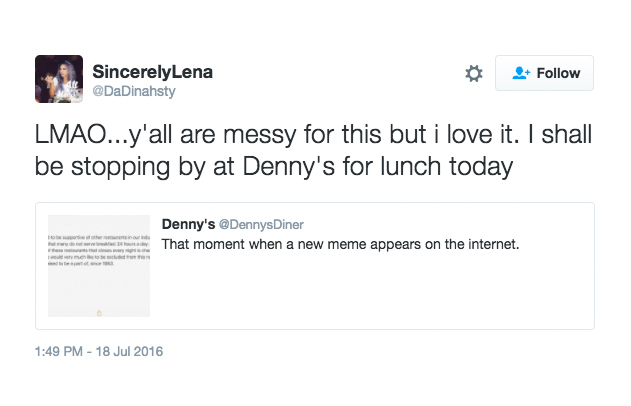 And then there was Denny’s. Although having a brand use social platforms like a regular user seems like a simple idea, no other brand dared to try it. 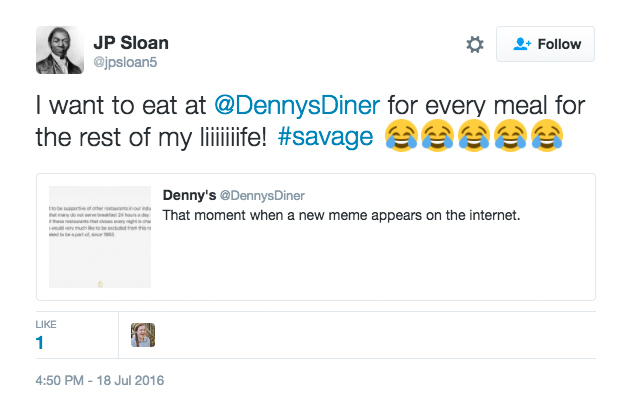 Denny’s didn’t want to patronize their followers, they wanted to be a part of their community. So we started talking like them, exploring like them, listening to them, and embracing the weird, creative, outlandish style of an ever-evolving multitude of social platforms…just like them. It all starts with our Tumblr — a platform where a 24-hour diner and night-blogging overlap: creative discussion, late night talks, sharing ideas and art — all kinds of things that happen in a diner booth. We knew starting a Tumblr and only posting menu items and discounts would get us laughed off the site, so we took stock of what that audience cared about and matched them. Our oddball approach was so refreshing that we didn’t just build a following, we built a fandom - where people respect our offbeat blog and don’t consume it as advertising. That same approach transferred well to Twitter, where the majority voice began leaning toward what’s now called “Weird Twitter”, a sassy, humorous, and quick-witted synthesis of the world around it. Having a personality on Twitter means having an opinion, so when Taylor Swift does something newsworthy we ask ourselves, “what’s Denny’s take on that?” Add to that an ability to react in real-time faster and funnier than most other brands, and we’re really cooking. After we cornered the creative uses of Tumblr and Twitter, Instagram was the next marketing platform to tackle. While most brands were rushing to post a studio shot of their product or take fake selfies with actors, we took our time to develop our Instagram strategy, which is a mix of the platforms tenants and our own signature style. With our follower growth ballooning from 12k to nearly 70k over the past year, we’d say our approach has paid off. Wearable food is the next big fashion trend, which is why we combined a unitard and corn. Unfortunately the name Unicorn was taken, so we present to you the Cornitard. Coming Spring 2017.
tots tots tots tots TOTS TOTS TOTS TOTS! TOTS! TOTS!! TOTS!! TOTS!!! TOTS!!! The S’mores Milk Shake is a modern work of art, but please don’t get stuck watching this loop for the rest of your life. It happened to Todd. Usher in the first day of fall in your favorite pair of MUGGs.